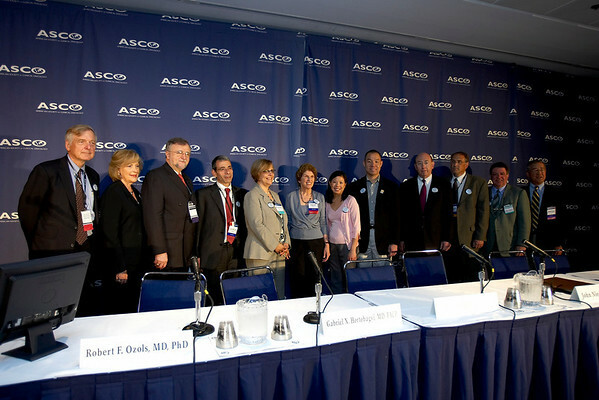 Chicago, IL - ASCO 2007 - Leaders of the American Society of Clinical Oncology (ASCO), patient advocates, and Directors of the National Cancer Institute's Cooperative Groups gather at the Opening Press Briefing, Friday June 1, 2007 during the American Society of Clinical Oncology's (ASCO) 43rd Annual Meeting. The meeting attracts more than 25,000 oncologists, researchers, and cancer care professionals from more than 100 countries. Date: Friday June 1, 2007. Credit: Photo Courtesy © ASCO/Todd Buchanan 2007. ASCO Contact: Tiffany Reynolds/Communications Dept. ; 703-519-1423. Technical Questions: todd@toddbuchanan.com; 612-226-5154.